HeCloud - Bristles comfortable chalking advanced fiber hair fine and strong, feel soft, hair soft, degree of saturation eat flour. Ship from US, delivery faster. About Products:1. Using high-quality fiber, hypoallergenic2. Fine and smooth hair soft, skin-friendly and strong3. Beautiful and stylish, easy to carry4. Pink material straps easily folded bag. 5. Smooth as a mirror tubes, convergence wood, The role of the fixed metal tube brush, natural, flawless, highlighting the quality6. Anti-bacterial package, pvc material with high-grade fabrics, Fine nylon thread stitching, PVC Bag, Biaoliruyi Matt surface scratches easily, Comfort starts from the bag7. HeCloud 32-Piece Set Professional Cosmetic Blending Makeup Brushes Set with Bag Black - Bristles comfortable chalking advanced fiber hair fine and strong, feel soft, hair soft, degree of saturation eat flourpackages:1x32pcs vander makeup Brush Set Kit1x CasePackage includes:14 x The Specifications Eyeshadow Brush6 x The Specifications Blush / Powder Brush3 x Concealer BrushAngle2 x Eye Liner Brush1 x Eyebrow Brush1 x Sponge Eye Shadow Brush1 x Lip Liner Brush1 x Eyebrow Comb brush1 x Eyelash Comb brush1 x Lip Brush1 x Extra Brush1 x Case Professional 32pcs Cosmetics Makeup brushes for women. Fine and smooth hair soft, skin-friendly and strong, great makeup brushes for your daily use. Beautiful and stylish, easy to carry when outside or travelling. VANDER - Features: brand New & High quality. Brush length : Approximately 7. 9" bag size: 24 * 15. 5 * 5cm folded product weight: 232g handle material:wood brush material:fiber batt case included: 6 x the specifications blush / powder brush 14 x The specifications eyeshadow brush 3 x Concealer BrushAngle 1 x eyebrow brush 1 x Sponge Eye Shadow Brush 1 x Lip Liner Brush 1 x Eyebrow comb brush 2 x Eye Liner Brush 1 x Eyelash comb brush 1 x Lip Brush 1x Extra brush Package Included: 1x Vander 32pcs Pro Makeup Brush Sets.
. Professional 32pcs cosmetics makeup brushes, complete Foundation, Eyeshadow Blending, Blush, Eyeliner & Face Powder. Soft and silky to the touch, the brushes are dense and shaped well. Made of high-quality synthetic, with the cruelty-free bristles which are well made of soft synthetic fibers, No shedding, you would feel amazing on your skin. Makeup Brushes, VANDER 32pcs Professional Soft Synthetic Kabuki Cosmetic Eyebrow Shadow Makeup Brush Set Kit - Perfect for contouring, highlighting and blending, great for beginners. Portable case bag design - Makeup Brush set accompany with you from home to travel. Moreover, each brush is designed with a sturdy, anti-slip wooden handle for precision application. And it is easy to wash clean for repeated uses. Introductions: master professional makeup techniques with our 32pcs Wooden Handle Professional Cosmetic Brush Set! Supremely soft and plush, it include 32 brushes that are made to perfectly apply your favorite makeup. And they will blend the ideal amount of pigment for a flawless result every time. VANDER - Professional 32pcs cosmetics makeup brushes, Blush, Eyeshadow Blending, complete Foundation, Eyeliner & Face Powder. Soft and silky to the touch, the brushes are dense and shaped well. Made of high-quality synthetic, No shedding, with the cruelty-free bristles which are well made of soft synthetic fibers, you would feel amazing on your skin. Perfect for contouring, highlighting and blending, great for beginners. Portable case bag design - Makeup Brush set accompany with you from home to travel. - Professional 32pcs cosmetics makeup brushes, Blush, complete Foundation, Eyeshadow Blending, Eyeliner & Face Powder. Soft and silky to the touch, the brushes are dense and shaped well. Made of high-quality synthetic, No shedding, with the cruelty-free bristles which are well made of soft synthetic fibers, you would feel amazing on your skin. Beauty Glazed - 15 glitter colors palette: each color is unique, beautiful, super shiny and pigmented. Long lasting: smooth fine texture with long lasting glittering factor with shimmer finish, gives you comfortable using experience and shinny eyes. Various colors for your option. Easy to use and goes on nicely. No more glitter flying! Detailed description: ➤ultra pigmented pressed glitter eyeshadow: no glitter glue or primer used at all! Better to apply primer or glue with this Palette the shadow will not move and will be waterproof. 15 glitter colors palette: Each color is unique, beautiful, super shiny and pigmented. The beauty glazed 15 shade glitter eyeshadow palette is your secret weapon to create the perfect eye make up. Beauty Glazed Ultra Pigmented Glitters No Glitter Glue Required Powder Glitter Eyeshadow Palette Creamy Glitter Pro Makeup Palettes for Glitter Eyes Shimmer and Gorgeous 15 Colors Waterproof Magnetic - No more glitter flying! Pressed powder technique making the soft powder easy to go on. Each palette comes with 15 pressed powder eyeshadows that can be used together to recreate your favorite looks or customize your own. Easy to use and goes on nicely. To make the shadows close to eyes firmly and long lasting, it`s better to apply primer or glue. Fashion and match different occasion. Perfect for professional smoky eyes makeup, wedding makeup, party makeup or casual makeup. Palette dimensions: 16. VANDER LIFE B076C6V8Q4 - 3. Leave it on the shadows and after that the smell gone. No more glitter flying! Meeting all your needs with different shapes face brushes. Portable case bag design - Makeup Brush set accompany with you from home to travel. 1 year warranty and 100% money back guarantee. With 24 pieces different makeup brushes, each specially designed to tackle specific areas of the complexion, 24 Piece Master Studio Brush Set magnificently caresses the face whilst simultaneously creating a flawless finish to any look. Each palette comes with 15 pressed powder eyeshadows that can be used together to recreate your favorite looks or customize your own. Become studio-ready with this revolutionary set of professional makeup brushes set from VANDER LIFE. 15 glitter colors palette: each color is unique, beautiful, super shiny and pigmented. Make up Brushes, VANDER LIFE 24pcs Premium Cosmetic Makeup Brush Set for Foundation Blending Blush Concealer Eye Shadow, Cruelty-Free Synthetic Fiber Bristles, Travel Makeup bag Included, Champagne - The beauty glazed 15 shade glitter eyeshadow palette is your secret weapon to create the perfect eye make up. Long lasting: smooth fine texture with long lasting glittering factor with shimmer finish, gives you comfortable using experience and shinny eyes. Widely use: can be used on top lip, wedding makeup, legs and body! Perfect for professional smoky eyes makeup, face, party makeup or casual makeup. Apply tips: use your finger instead of brushes to apply the glitter to get good piment!! Graceful, sumptuous and refined, this collection would make an incredible addition to any beauty addict's dressing table. 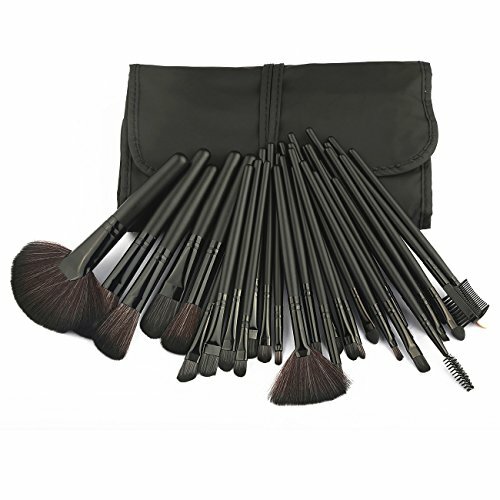 Makeup brush set, 24 pcs face makeup brushes makeup brush set contained within a luxurious, chic brush wrap bag, 24 Piece Master Studio Brush Set ensures that anyone and everyone can become a masterful makeup artist by providing all of the possible beauty tools. VANDER - Money back guaranteed in 1 year. Durable case included to keep your makeup beauty brushes protected 4. Meeting all your needs with different shapes face brushes. Portable case bag design - Makeup Brush set accompany with you from home to travel. 1 year warranty and 100% money back guarantee. Made of synthetic hair, soft to use 3. Continue rinsing until no color leaves the brush. Buy with confidence and you will love it. If you have any problem, feel free to contact us. High quality makeup brushes, and comes with a Roll up carrying case stores, ideal for travelling. 4. The beauty glazed 15 shade glitter eyeshadow palette is your secret weapon to create the perfect eye make up. Makeup Brushes Set Professional Makeup Brush Cosmetic Set Kit Wooden Handle Cosmetics Foundation Eyeliner Eyeshadow Face Powder Blush Lipstick Brushes-32 piece - All types of makeup brushes set: blush, Lip，concealer, eye shadow, blending, contouring, highlighting, eyebrow, shading, and more. Soft, smooth dense synthetic hair brushes designed for makeup artists and professional cosmetic use but also for beginner to help create an array of different looks. The beauty brushes are perfect for individuals with normal to sensitive skin and will not irritate you 6. Premium synthetic makeup brushes - made with soft cruelty-Free Synthetic and Dense synthetic fibers no skin hurting, suitable for even the most sensitive skin, to provide a high definition finish with liquid, powders or cream foundation without any absorption of product and no shedding. Complete set of essential makeup brushes for makeup lovers from professional to amateur level. - Each palette comes with 15 pressed powder eyeshadows that can be used together to recreate your favorite looks or customize your own. Our brushes are made with only the soft bristles! We strive to make the best cosmetics applicators at the most affordable prices for our customers! Easy to use and goes on nicely. Meeting all your needs with different shapes face brushes. Portable case bag design - Makeup Brush set accompany with you from home to travel. 1 year warranty and 100% money back guarantee. Long lasting: smooth fine texture with long lasting glittering factor with shimmer finish, gives you comfortable using experience and shinny eyes. Widely use: can be used on top lip, legs and body! Perfect for professional smoky eyes makeup, face, wedding makeup, party makeup or casual makeup. Apply tips: use your finger instead of brushes to apply the glitter to get good piment! !15 glitter colors palette: each color is unique, beautiful, super shiny and pigmented. Vander Makeup Brushes Set Professional - . All types of makeup brushes set: blush, eyebrow, eye shadow, Lip，concealer, blending, contouring, shading, highlighting, and more. Soft, smooth dense synthetic hair brushes designed for makeup artists and professional cosmetic use but also for beginner to help create an array of different looks. Because we manufacture our own brushes, we can offer lower price，but good quality to our valued customers like you. Jmkcoz Jmkcoz001 - All types of makeup brushes set: blush, contouring, blending, eyebrow, highlighting, shading, eye shadow, Lip，concealer, and more. Soft, smooth dense synthetic hair brushes designed for makeup artists and professional cosmetic use but also for beginner to help create an array of different looks. During travelling or outing you also can have a pretty look. Wide application: no matter you are a makeup beginner or professional makeup artist, jmkcoz eye shadow palette is your great choice. Use the same pencil to dot below your lower lashes. Your girls, photo shooting, wedding, meeting, stage performance or daily casual make up. Freshness, female family and friends will be delighted to get such a sweet present. Jmkcoz Eye Shadow 120 Colors Eyeshadow Eye Shadow Palette Colors Makeup Kit Eye Color Palette Halloween Makeup Palette Matte and Shimmer Highly Pigmented Professional Cosmetic - Money back guaranteed in 1 year. Multicolor for makeup: 120 full color palettes eyeshadow sets, include matte and shimmer colors match your every look. You do not need a base or anything like that Way to apply Classic Eye Makeup: 1. Apply a sheer tone all over the lid, right up to the eyebrow 2. Use a shade of chocolate brown and apply it to your outer V on your top lid 3. Softly line the top lid with the brown shadow, using an angled brush 4. Apply liquid liner and mascara professional 32pcs cosmetics makeup brushes, Eyeshadow Blending, Blush, complete Foundation, Eyeliner & Face Powder. - Money back guaranteed in 1 year. Multicolor for makeup: 120 full color palettes eyeshadow sets, include matte and shimmer colors match your every look. Our brushes are made with only the soft bristles! We strive to make the best cosmetics applicators at the most affordable prices for our customers! Eyeshadow collection comes in shimmer and matte shades making these captivating palettes very versatile to go from an everyday look to a night out. Delivered within 4 days max. Each unique look is featured in its own luxurious glossy look with a double-ended brush and mirror inside. Buy with confidence and you will love it. If you have any problem, feel free to contact us. High quality makeup brushes, and comes with a Roll up carrying case stores, ideal for travelling. LA Girl Beauty Brick Eyeshadow 4 Color Choices - Essential brushes are perfect for liquids, powders, or creams to produce a beautiful face and eye makeup application. Versatile brush set - cover all size and shape of brushes to carve and sculpt the face for flawless dimension. Premium synthetic makeup brushes - made with soft cruelty-Free Synthetic and Dense synthetic fibers no skin hurting, to provide a high definition finish with liquid, suitable for even the most sensitive skin, powders or cream foundation without any absorption of product and no shedding. Complete set of essential makeup brushes for makeup lovers from professional to amateur level. Close it when do not using, perfectly protecting the eye shadow from dirts and dusts. BYS - No more glitter flying! During travelling or outing you also can have a pretty look. Wide application: no matter you are a makeup beginner or professional makeup artist, jmkcoz eye shadow palette is your great choice. A must-have in every girl's makeup kit! Eyeshadow collection comes in shimmer and matte shades making these captivating palettes very versatile to go from an everyday look to a night out. Delivered within 4 days max. Each unique look is featured in its own luxurious glossy look with a double-ended brush and mirror inside. No makeup look: a highlighting makeup that embraces your natural skin. This highlighting kit doesn't fade or leave creases, even if you wear it all day. This highlighting palette kit is housed in a portable, sleek tin case with a full-sized mirror and contouring brush so you could bring it anywhere you go. enhance complexion with the finest pearlescent powder five highly pigmented multidimensional shades offer rich color payoff - BYS Highlight 2 Makeup Palette with Contour Brush and Mirror - Meeting all your needs with different shapes face brushes. Portable case bag design - Makeup Brush set accompany with you from home to travel. 1 year warranty and 100% money back guarantee. It can help you creat various style of makeup looking for party, dating, classic even dramatic smoky eye make up can complete easily with our eye shadow palette. Easy to use and goes on nicely. This lightweight powder formula blends seamlessly and enhances your skin tone to provide a flawless, no-makeup look and feel.